"Baltimore Colts" redirects here. For the franchise that existed from 1947 to 1950, see Baltimore Colts (1947–50). For the Canadian Football League team, see Baltimore Stallions. For other uses, see Baltimore Colts (disambiguation). The professional American football franchise currently known as the Indianapolis Colts was originally based in Baltimore, Maryland, from 1953 to 1983. This article chronicles the franchise's history during its time as the Baltimore Colts. Named in honor of Baltimore's history of horse breeding and racing (including the Preakness Stakes, one of the events in the U.S. Triple Crown championship series), this was the second incarnation of the "Baltimore Colts" after the first one played from 1947 to 1950. The 1953-83 Baltimore Colts team played its home games at Memorial Stadium during its entire tenure in Baltimore before the franchise relocated to Indianapolis, Indiana, in March 1984. Miami Seahawks of the A.A.F.C. are folded and replaced in the Conference's second season by a new franchise in Baltimore given the name of the "Colts" after a name selection contest among the new Baltimore fans. The Colts later joined the reorganized N.F.L. in 1950, following the merger of the A.A.F.C. with the older league, along with the addition of teams San Francisco 49ers and the Cleveland Browns. This second Baltimore Colts franchise was later dissolved by the NFL for financial reasons after only the one 1950 season on January 18, 1951. New York Yanks of the NFL were canceled after the one 1951 season and replaced in 1952 by the Dallas Texans, with the first expansion of the League into high school and collegiate football crazy Texas and first into the southern part of the United States. As the result of a fan contest in Baltimore, won by Charles Evans of Middle River in suburban eastern Baltimore County, the team was renamed the "Baltimore Colts". On September 7, 1947, wearing the green and silver uniforms, the Colts, under Head Coach Cecil Isbell, won their initial All-America Football Conference game in the A.A.F.C. 's second season, 16–7, over the Brooklyn Dodgers. Home site for the new AAFC games in "The Monumental City" was the old 1922 Municipal Stadium (also known as "Baltimore Stadium" or "Venable Stadium" - located in previous Venable Park) on the north side of 33rd Street boulevard in northeast Baltimore, later renovated and rebuilt with an upper tier added the following year for use also by the new American League of major league baseball's relocated franchise, the Baltimore Orioles). The football team concluded its inaugural season before a record Baltimore crowd of 51,583 by losing to the New York Yankees, 21–7. The Colts finished with a 2–11–1 record, good for a fourth-place finish in the Eastern Division of the A.A.F.C. The Colts completed the 1948 season with a 7–8 record, tying the Buffalo Bills for the division title. The Colts compiled a 1–11 mark in their third season of 1949. Y.A. Tittle, later to gain additional hall of fame status a decade later with the NFL's New York Giants was the Colts starting quarterback. After two seasons without professional football, NFL Commissioner Bert Bell, (1895-1959), challenged the City of Baltimore under Mayor Thomas L.J. D'Alesandro, Jr., (1903-1987), in December 1952 to sell 15,000 season tickets within six weeks in order to re-enter the NFL. That 15,000-ticket quota was reached in just four weeks and three days. On January 23, 1953, with the encouragement of the city's civic and business leadership, under the principal ownership of Carroll Rosenbloom, (1907-1979), the NFL sold Dallas Texans franchise to Baltimore where, keeping the "Colts" nickname, the Texans team colors of blue and white were inherited. This is the franchise that exists today in Indianapolis in the modern National Football League. In 1953, the second incarnation of the Baltimore Colts took the field for the first time ever at Memorial Stadium, (then also used temporarily by the old Baltimore Orioles minor league team in the International League since the burning in July 1944 of their Oriole Park home farther southeast at Greenmount Avenue and 29th Street in Waverly. The newly renamed Memorial field was being rebuilt and adding a second upper tier to old Municipal Stadium for use by the following year of the major league baseball's Baltimore Orioles franchise in the American League, relocated that November from St. Louis, Missouri as the St. Louis Browns. The 33rd Street field also then sometimes known as "Baltimore Stadium" or "Venable Stadium" for its location in the former Venable Park along the north side of the 33rd Street boulevard, constructed originally as a football-only bowl in 1922 in only seven months and later capable of holding almost 100,000 fans for the frequent high school and local collegiate/university games there during the following three decades), on September 27 to face off against the Chicago Bears. The Colts would go on to win the game 13–9 and stun the Bears. The team's lack of experience showed as the team finished 3–9. In 1955, the Colts had 12 rookies make the team. In 1956, quarterback George Shaw went down with a serious injury in the fourth game of the season. The Colts' unproven backup, Johnny Unitas, would go on to win half the remaining eight games to give the Colts a record of 5–7 for the season. Following the Colts' first NFL championship, the team once again posted a 9–3 record during the 1959 season and once again defeated the Giants in the NFL Championship Game to claim their second title in back to back fashion. Following the two championships in 1958 and 1959, the Colts did not return to the NFL Championship for four seasons and saw a transition from head coach Ewbank to a young Don Shula in 1963. In Shula's second season the Colts compiled a 12–2 record, but lost 27–0. to the Cleveland Browns in the NFL Championship. However, in 1968 the Colts returned with the continued leadership of Unitas and Shula and went on to win the Colts' third NFL Championship and made an appearance in Super Bowl III. 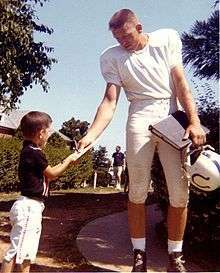 In 1968, Unitas was injured and replaced by Earl Morrall who became the league's MVP. Rosenbloom of the Colts, Art Modell of the Browns, and Art Rooney of the Pittsburgh Steelers agreed to have their teams join the ten AFL teams in the American Football Conference as part of the AFL-NFL merger in 1970. The Colts immediately went on a rampage in the new league, as new head coach Don McCafferty led the 1970 team to an 11–2–1 regular season record, winning the AFC East title. In the first round of the NFL Playoffs, the Colts beat the Cincinnati Bengals 17–0; one week later in the first ever AFC Championship Game, they beat the Oakland Raiders 27–17. Baltimore went on to win the first post-merger Super Bowl (Super Bowl V), defeating the National Football Conference's Dallas Cowboys 16–13 on a Jim O'Brien field goal with five seconds left to play. The victory gave the Colts their fourth NFL championship and first Super Bowl victory. Following the championship, the Colts returned to the playoffs in 1971, winning their opening playoff game against the Browns 20-3, but lost in the second AFC Championship Game in Miami 21-0. Following this relative success in the 1970s, the Colts suffered a string of disappointing seasons, often finishing in last place in their division. Attendance began to dwindle in the early 1970s and remained that way for the rest of the team's tenure in Baltimore. The Colts would endure nine consecutive losing seasons beginning in 1978. In 1981, the Colts defense allowed an NFL-record 533 points, set an all-time record for fewest sacks (13), and also set a modern record for fewest punt returns (12). The following year the offense collapsed, including a game against the Buffalo Bills where the Colts' offense did not cross mid-field the entire game. The Colts finished 0–8–1 in the strike-shortened 1982 season, thereby earning the right to select Stanford quarterback John Elway with the first overall pick. Elway, however, refused to play for Baltimore, and using leverage as a draftee of the New York Yankees baseball club, forced a trade to Denver. Behind an improved defense the team finished 7–9 in 1983, but that would be their last season in Baltimore. The city of Indianapolis, Indiana, made an offer for the Colts franchise to move there. Baltimore was unsuccessful at persuading them to stay, so the city government attempted to get the state legislature to condemn the Colts franchise and give ownership to another group that would promise to keep the Colts in Baltimore. Oakland, California had just had some success in court trying the same tactic with the Oakland Raiders. Under the threat of eminent domain from the city of Baltimore, the franchise relocated to Indianapolis in the middle of the night on March 29, 1984. The city of Baltimore did not give up and sued to condemn the franchise anyway and seize ownership. Baltimore did not prevail in court, but eventually acquired a new NFL team in 1996 with the establishment of the Baltimore Ravens following the Cleveland Browns relocation controversy. The NFL treats the Baltimore Colts and the Indianapolis Colts (including logos, history, and records) as one continuous franchise from 1953 to the present. Despite this, former Baltimore Colts players, led by Johnny Unitas, disowned the Colts franchise after the move to Indianapolis, instead choosing to remain loyal to the City of Baltimore. These former players embraced the new Baltimore Ravens franchise when it arrived in Baltimore in 1996. The Ravens responded by adding some of these players to the Baltimore Ravens Ring of Honor. The Ravens officially have no retired numbers, but out of respect for Unitas, only quarterback Scott Mitchell has worn the number 19, which he did in his lone season in Baltimore in 1999. The Baltimore Colts Marching Band, which continued to operate after the Colts moved, became Baltimore's Marching Ravens. Although the retired numbers of the Indianapolis Colts officially includes Unitas and others dating back to the Baltimore days, the Indianapolis Colts Ring of Honor currently only includes players who have played in Indianapolis. The Indianapolis Colts have issued these nominally retired jersey numbers before. ↑ Gibbons, Michael (2006-08-07). "Baltimore's Colts: A Team for the Ages". Press Box Online. Retrieved 2007-08-19. ↑ "A look at the history of the Indianapolis Colts". 1 2 3 "Baltimore Colts: Historical Moments". Sports Encyclopedia. Retrieved July 5, 2012. ↑ Cole, Jason (December 30, 2009). "Ewbank overlooked figure of AFL glory". Yahoo! Sports. Retrieved July 5, 2012. ↑ "Top 15 Team Not to Win the Super Bowl:1968 Baltimore Colts (13–1)". Sports Illustrated. Retrieved July 4, 2012. ↑ Shaughnessy, Dan (January 19, 2010). "There's plenty of history between AFC finalists Jets and Colts". Sports Illustrated. Retrieved July 5, 2012. ↑ Brady, Dave (January 13, 1969). "Jets Shock Colts in Super Bowl, 16–7". Washington Post. Retrieved July 4, 2012. ↑ Milian, Jorge (February 1, 2010). "Remembering Super Bowl V: Baltimore Colts' Jim O'Brien got a win and a future wife". The Palm Beach Post. Retrieved July 5, 2012. ↑ Maule, Tex (August 14, 1972). "Fed up with his Colts, Carroll Rosenbloom traded for the Rams". Sports Illustrated. Retrieved July 5, 2012. ↑ "1981 Baltimore Colts Statistics". Pro Football Reference. Retrieved July 4, 2012. ↑ Blanchat, Jack. "Football: A look back at Stanford's other No. 1 picks". The Stanford Daily. Retrieved July 5, 2012.